As governments and private companies gear up for Space Race 2.0, U.S. Vice President Mike Pence takes charge as the head of the newly restored NSC. Vice President Mike Pence, promising a new era of space exploration, said that the U.S. would put “American boots” back on the moon and also on Mars. As we near Space Race 2.0, it seems that a lot has changed since Mike Pence, current Vice President, was not a big fan of NASA’s space projects. Back in 2005, Pence was at the head of a group who demanded the cancellation of the NASA’s Constellation Project which sought to return to the Moon no later than 2020, and then expand into the solar system. Budgetary concerns led to the cancellation of the Constellation Project in 2011, which Charles Bolden, NASA’s former administrator has compared to “a death in the family” as multi-year effort and billions of dollars went to waste. Now, Pence is the chairman of the American Space Council, and he’s taking his new mission very seriously. In 1989, then President George H.W. Bush created the National Space Council, on the ruins of the defunct National Aeronautics and Space Council (1958-1973). The NSC remained operational until 1993 when it was disbanded and the National Science and Technology Council took over its function. During his presidential campaign, Barack Obama had promised to re-establish the council but failed to deliver on his promise over two terms. President Trump has officially re-launched the National Space Council that would seek to reestablish the American space leadership. On Friday, June 30, Trump was surrounded by Congress members, and representatives from NASA and commercial space contractors when he signed the executive order that revives the National Space Council after two decades in limbo. Mike Pence will serve as the chairman of the NSC, which is composed of members including U.S. Defense Secretary James Mattis and U.S. Secretary of State Rex Tillerson, and other top U.S. officials. As an advisory group within the Executive Office of the President, the NSC would define priorities of the White House space policy and oversee the materialization of the U.S. space vision as a whole. In a statement, Robert Lightfoot, NASA’s acting administrator–The White House has yet to appoint a permanent administrator–said he was pleased with the presidential order that reestablishes the NSC, and that he was looking forward to working with the council. Space Race 2.0: Making the American Space Dream Great Again! It depends on how you look at it, but a Vice President chairing over the council could be seen as an evidence of White House support for space exploration. Or, it could be just another bureaucratic move. It might be too early to judge Mike Pence and the NSC, however, as the new chairman seems to have immediately shifted into high gear. Last Thursday, merely a week after the re-launch of the NSC, Mike Pence, visited the Kennedy Space Center near Cape Canaveral, Florida where he took a look at the space vehicles of NASA’s private subcontractors. During his tour at the KSC, Pence also got to see NASA’s Orion capsule that will fly in 2019 with the monster rocket SLS (Space Launch System). Mike Pence gave a 25-minute speech about the perspectives of the U.S. space policy and gave general outlines of the Trump Administration’s vision for space exploration. Hundreds of NASA employees, space experts and private contractors–including Buzz Aldrin, the second man to walk on the Moon–gathered in the gigantic Vehicle Assembly Building. Pence said that NASA’s efforts would be reoriented toward manned space missions, and promised that the United States would maintain a constant presence in the low Earth orbit by sending missions to the moon, Mars and beyond. Speaking of a “new era” in space exploration, the Vice President mentioned twice the return to the Moon, however without giving details on a new lunar mission. 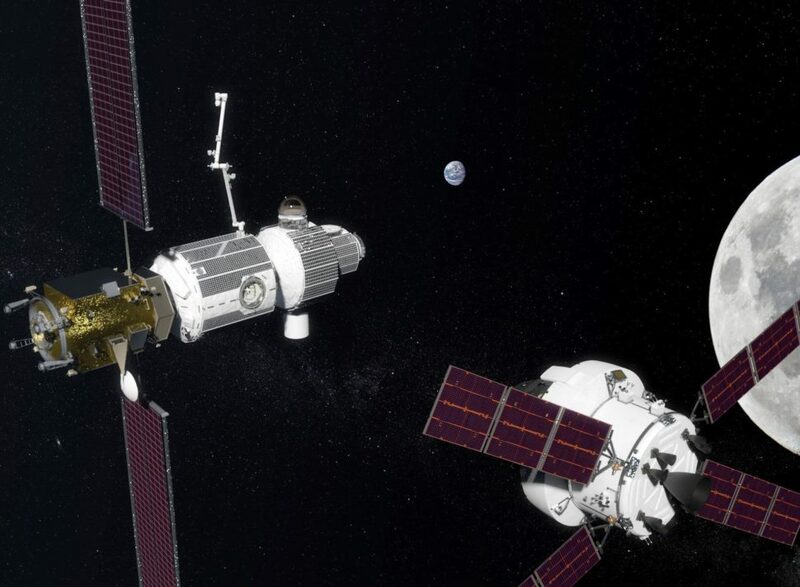 A few months ago, NASA has revealed its ambitious project called Deep Space Gateway, which hopes to erect a spaceport in the vicinity of the moon. The DSG would be used to send astronauts into the lunar orbit and serve as a gateway to distant space destinations. It’s unclear if the Vice President was referring to the DSG or other still undisclosed projects coming down the line. NASA has tasked SpaceX and Boeing with building space vehicles to transport its astronauts to the ISS by 2018, and both companies are working on their models. However, a recent report by the U.S. Government Accountability Office suggests that NASA’s Commercial Crew Program might be pushed back as the two companies probably won’t meet the schedule. As Pence was delivering his speech, there were, in addition to NASA’s Orion, a training version of Boeing’s crew vessel Starliner and the SpaceX Dragon. In an effort to win the Space Race 2.0, he said the U.S. government would continue to foster cooperation with the private space companies to make space travel cheaper, safer, and more accessible than ever before. The pad that will launch the SLS flights was empty on Thursday as SpaceX has used it the night before to launch a Falcon rocket carrying a communications satellite. Mike Pence said he was sorry to have missed the launch and that he prayed for rain at the Kennedy Space Center so he’d get to see the Falcon going up on Thursday. Pence’s call echoes President Dwight D. Eisenhower’s call for U.S. space leadership, on this same month, almost sixty years ago. In fact, July 29th will be the 59th anniversary of Eisenhower’s creation of NASA. Eisenhower knew that for the U.S. to lead space development and exploration that they would have to have a unified, government sponsored initiative. Perhaps Pence took note and is following in his footsteps as he gears up for Space Race 2.0. Stay tuned for Part 2, where we look deeper into Eisenhower’s space initiatives and how we could apply his strategy to Space Race 2.0.